Full disclosure – I was provided an advanced reader’s copy of this book by the authors but have voluntarily provided a review. All opinions are my own. 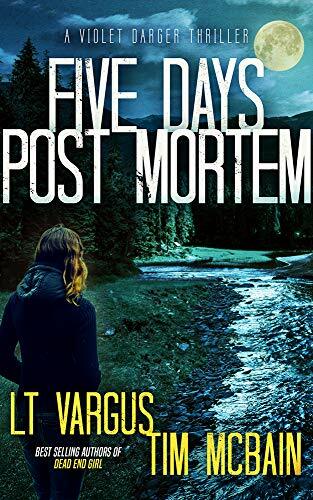 Five Days Post Mortem is the fifth in the Violet Darger series of books by author duo Tim McBain and LT Vargus. Set not too long after the close of “Bad Blood”, a disillusioned Darger has taken a hiatus from the bureau to explore other options and ponder her current career choices. At Loshak’s prodding, Darger finds herself as the newest member of Prescott Consulting Services and is whisked off on her first assignment. A series of bodies have washed up on the banks of various bodies of water in Sandy, Oregon all women, all apparently drowned. Darger and fellow consultancy member Ted Fowles work to assist the local PD in unraveling what is shaping up to be a series of serial murders going back possibly decades. But when the entomologist’s findings do not mirror the coroner report, Darger realizes that they need to spread a wider net if they are going to catch this killer. With time ticking down to the next victim, the duo finds themselves outside the relative safety of the “consultancy cocoon” and into the thick of the action. Darger not only has to face down a killer but also personal demons as she tries to close the case. Five Days Post Mortem can really be described as a transition period for agent Darger. Not officially an ex FBI agent, Darger is straddling the line between two worlds as she attempts to determine which one is best for her. Still reeling from the corruption she uncovered in Bad Blood, Darger is seeking an outlet to continue to fight the good fight without the hindrances of bureaucracy and corruption. What she discovers though is that the solution may not be a panacea, but rather a “lesser of two evils” choice for her to make and I’m not sure if she will be able to make that choice easily. Once again, the dynamic duo of McBain and Vargus have crafted another case that will keep the reader guessing until the very end. I really loved how nothing was given away, from the “first person” narrative of the unhinged killer to the discovery of new victims and clues Five Days Post Mortem will keep even the most seasoned police procedural fan on their toes. With Darger’s state at the end of this installment, it will be interesting to see what career choice she makes as the next story unfolds, but one thing is for sure – it will most likely be a much wiser and guarded Violet than we have yet to see.